Cafes have taken Korea by storm over the past decade. In cities, it is impossible to walk a block without encountering at least one coffee shop, whether it is part of a giant chain or a mom-and-dad operation.This trend has caused enormous competition in the world of coffee. To differentiate themselves, entrepreneurs and shop owners are coming up with creative ideas to make their businesses stand out. The result is that a simple "coffee break" in Seoul can mean anything, quite literally. Want to pat a furry animal while sipping a latte? No problem. Would you rather hear about your future from a fortune teller? That can be done, too. Here is our list of unique coffee houses in the nation's capital that encapsulate Korea's love of fun cafe experiences. If being called a "crazy cat lady" hurts your feelings, this is the perfect place for you. Pet cafes have been around for almost 15 years and remain one of the most popular themes. Seoul's Hongdae and Myeondong districts have the highest concentration of such shops, but they are easy to find elsewhere. Customers must typically buy a drink (7,000-10,000 won) or snack, and are then allowed to play with a cat or dog in a beautiful and safe environment. These cafes usually specialize in one animal. If you happen to fall in love with the pet you are holding, ask if it is up for adoption. The cafes often take care of abandoned animals, so adoptions from are sometimes welcomed to make room for more animals. One popular dog cafe chain is Bau House (bau.cyworld.com), which has multiple locations including in Hongdae and Dongdaemun, Seoul. "Namu Guneul" (www.restree.net) has become a tourist attraction because of its unique service called "Dr. Fish." The cafe has a pool with tiny fish, known as "skin care fish" that nibble the dead skin cells off your feet. For a paltry 3000 won, you are guaranteed a neat, ticklish pedicure from these hard-working fish, which are glad to feast on your feet. If that is not enough, the cafe offers free coffee refills and unlimited bread. Do you love high-quality in-flight meals or traveling in general? 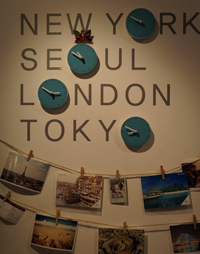 Air Cafe (theaircafe.alldaycafe.kr) in Hongdae is dedicated to everything about traveling. It is filled with travel-related materials such as model planes, travelers' magazines and exotic souvenirs from around the world. You can choose from "in-flight menus" from actual airlines. Select your meals based on your "class," such as economy, and grab a table by the window with in-flight-type seats for the full flying experience. Tarot cards are the most popular form of fortune-telling in Seoul. Also known as "saju cafes" these businesses offer a variety of services to help you "look into the future." They are easy to spot in popular leisure districts such as Myeongdong, Gangnam and Hongdae. 지난 십년동안 카페 문화가 한국을 휩쓸었다. 이와 같은 경쟁이 점점 더 치열해 지는 가운데, 코리아타임즈가 뽑은 이색가지 카페 네곳을 소개한다. 펫카페는 지난 십오년간 최고의 테마카페로 꾸준히 사랑을 받아왔다. 전국에 위치한 펫카페에서 음료나 간식을 주문을 하면, 귀여운 펫들과 함께 시간을 할 수 있다. 3000원을 내고 물고기 수십마리에게 페디큐어를 받아보면 어떨까. 카페 나무그늘의 손님들은 큰 탕에서 발 각질제거를 하며 특별한 시간을 보낼 수 있다. 비행기와 여행을 테마로 한 '에어카페'는 실제 기내식을 판매하는 것으로 유명하다. 어디론가 날아가고 싶은 날에 비행기 카페에서 기분전환을 하는것도 좋을 듯 하다. 타로, 사주 카페는 한국에 가장 많이 퍼져있는 카페중에 하나이다. 연애운, 직업운 등 카테고리당 만원을 내고 행운을 들을 수 있다.